As the Irish National e-Infrastructure, the e-INIS initiative is intended to provide Irelands research community with access to world-class computational, networking and support infrastructure. 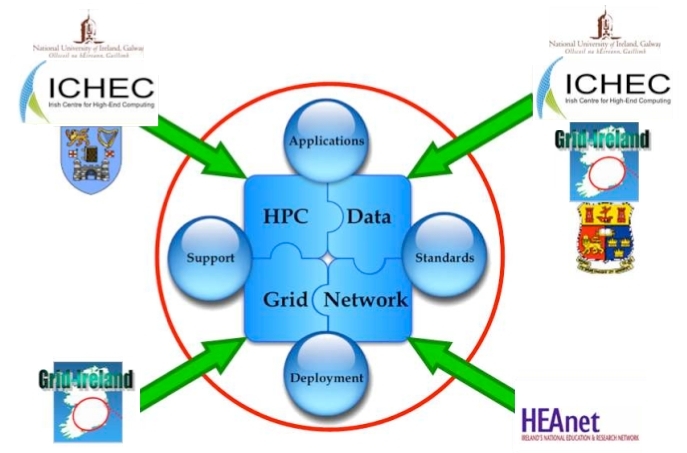 Coordinated by the Dublin Institute for Advanced Studies and including a number of key infrastructure and institutional partners, the project aims to provide researchers from a wide range of disciplines with the best of ICT resources including leading-edge HPC, communications and data storage services. The project is funded by the Higher Education Authority under cycle 4 of the Programme for Research in Third Level Institutions, and consolidates a broad range of expertise form national partners. Building on the proven success of the participating infrastructure providers, e-INIS will consolidate and enhance the offerings available to the community and seek to develop sustainable models for the continued provision of the key facilities that comprise a national research infrastructure. The combination of HPC and Data resources with high performance networking will not only support existing research but empower national researchers to undertake their work in new and novel ways. In addition to the physical ICT resources, dedicated e-INIS support scientists provide ongoing training and support of the national user community. The consortium will leverage existing technologies and relationships to further collaborations at international level ensuring that Ireland is linked with similar e-Infrastructure projects across Europe and beyond. e-infrastructures are a core focus in European framework projects and e-INIS seeks to ensure that Ireland takes a leading position in the provision of integrated ICT to national researchers. This combined effort among infrastructure providers will lead towards an integrated research platform on which high-level applications may be constructed. Through publicity, training, and outreach activities, e-INIS aims to increase the uptake of the e-Infrastructure across the broader research community including the sciences, arts & humanities, and social sciences.